NYC is prepping for the first big snow storm of 2015 and I need to go out and stock up on wine! So this week I am keeping it super short and sweet with a few news & notes and then we go right into my newest giveaway—a Bobble water bottle. Book Vs Movie Podcast: We are now on a new platform so if you signed up for our iTunes podcasts you might need to do so again (sorry about that!) here is the new link https://itunes.apple.com/us/podcast/bookvsmovies-podcast/id954110320?mt=2. Our next episode will be Gone Girl by Gillian Flynn—whoo hoo!!! Fit Bottomed Girls Dance Playlist: I was asked to create another 30-minute playlist for Fit Bottomed Girls and this one makes me all kinds of happy because it features some of my favorite dance tunes. Let me know what you think it! Jamberry parties & Sarah Scott: My fit blogger buddy Sarah Scott is hosting on my Blog page a Jamberry Nails Party where you can win all kinds of fun prizes so go check it out while we are still live! 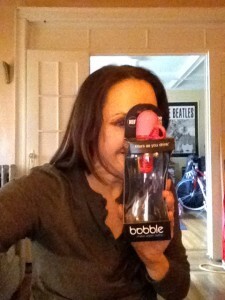 Bobble Giveaway: Like most people—I carry bottled water with me everywhere but I am concerned about the impact of all of that plastic on the environment. This week I am giving away to one of you lucky readers your very own Bobble—check out the Vlog below on how to win! I will pick one winner at random on Monday, February 2, 2015 at NOON Eastern Time and contact them directly. Good luck! This entry was posted in Uncategorized and tagged 80s Gym Trends, Bobble Bottles, Brandi Koski, Brooklyn Fit Chick, Fit Bottomed Girls, Jamberry Nails, playlist, TapGenes.com by brooklynfitchick. Bookmark the permalink. I am interested in winning. I’m definitely interested! I would love to try a Bobble! I subscribed to your youtube channel as terese dudek and tweeted! thanks for the chance! BE SAFE in that storm & glad the eye is better! I have been attacked by a dog so… HUGS! I am definitely interested as well. Thanks for the giveaway!